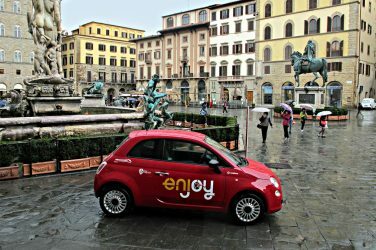 Avoid using your car to explore Florence. Parking spaces are incredibly scarce, the traffic can be horrific and the city is full of one-way streets. Some parts of the city center are pedestrian, others are known as Zone a traffico limitato – off-limits to non-resident cars with special permits. When the stop light is red, you may not enter the area, if it is green, it signifies a “Free Access” to all vehicles, regardless of their permits. There are video surveillance cameras scattered around the city that take photos of all cars and their license plates. The penalty for driving in one of these areas is an expensive fine (100€). 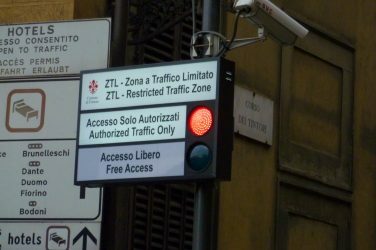 Finally, there are also reserved lanes all over Florence that can only be used by public buses, taxis, ambulances and police cars. It is clear that driving around Florence with a car is not the most practical and stress-free option. 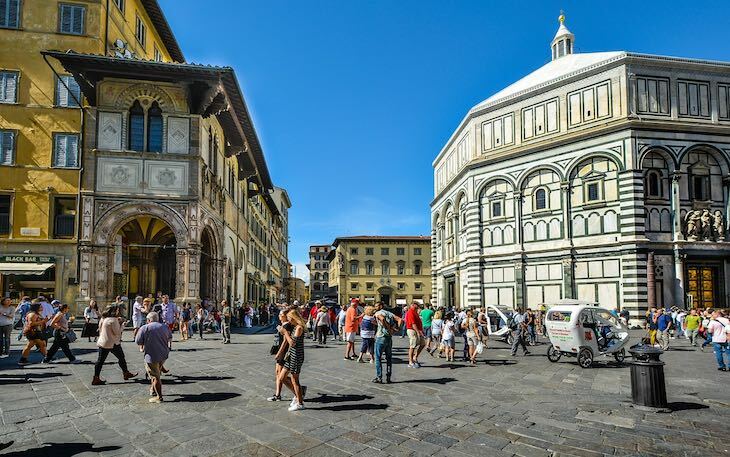 The best way to visit Florence is by foot: the city center is small, easily accessible, and mostly pedestrian. To get from the train station to the Duomo it only takes 10 minutes, and from there you just have to walk another 5 minutes to reach the Uffizi Galleries (right by Ponte Vecchio)! Every single street is filled with historical importance, stunning monuments, churches, hidden passages, that you will best be able to appreciate and discover through leisurely strolls. All of the main monuments are very close to each other, and the popular shopping area (between Borgo Ognissanti, Via della Vigna Nuova, Via Tornabuoni, Via Calzaiuoli, the Ponte Vecchio and Via Panzani) is equally accessible by foot. That being said, there are other options. Renting bikes in Florence is quite cheap: about 2€ per hour, 10€ per day. Bikes are available from stands scattered around the city – the Central railway station, Piazza Ghiberti, etc. 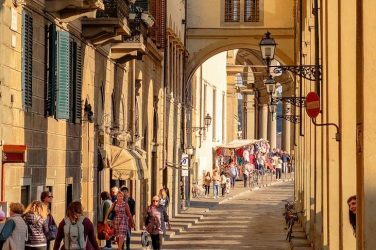 The most popular bicycle rental service is Florence By Bike, located in Via San Zanobi, that offers a wide selection of bikes and accessories for every need (child seat, basket…). You can also find many other bike rental shops scattered around the city such as Tuscany Cycle and Giramondo By Bike situated in Via Ghibellina, Flo Rent in Via della Mosca, and if you prefer the electric technology you can rent electric bikes at E-Bikes Florence in Via Santa Reparata. Instead of renting a bike, you can choose to use a bike sharing service. 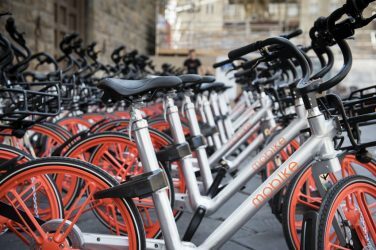 Download the app Mobike (for iOS, for Android), a bike sharing facility that does not require you to go to a specific place to rent a bike. You can just pick up bikes from wherever you find them in the city. Just be sure to lock your bike when you are done, or you will be charged for the extra time! Another bike sharing service will soon be available in Florence: Ofo. This will replace Gobee, a bike sharing facility that has been subjected to many vandal acts. Moreover, when riding a bike in Florence, you must stay attentive, as there are many gaps in the paving stones, and sometimes scooters tend to try and overtake you, or cut you off. If you are in the city center this is not a big deal, as most areas are pedestrian: you will just have to battle against the crowd of tourists! ATAF runs most of the buses in Florence (they are orange, and the newer models are red and white or blue). You can check routes and timetables on their official website or on Google Maps. You can buy bus tickets (1,20€) in coffee shops, newsagents, tobacconists, as well as on the bus, but the tickets will be more expensive, and they often run out of them. The ticket is valid for 90 minutes, so you can re-use the same one (if you change the bus it remains valid). Buying onboard ticket is a little more expensive (2,00€). You can also decide to buy a 2-ride ticket at the cost of 2,40€ or a 4-ride ticket at the cost of 4,70€. Another useful option is the Carta Agile, an electronic card valid for 10, 20 or 30 rides (at the different cost of 10€, 20€ or 30€). Once on the bus, to validate the card you simply have to place it on the e-reader. The acoustic signal means “valid ride”. Remember that you can’t use Carta Agile for more people: every person must have one! As final option, you can text “ATAF” to the number 4880105 from your phone, at the cost of 1,50€. Multiple-day tickets are also available (24 hours, 3 days, 7 days). You can find all these options following this link. If you buy the Firenze card to get into museums, you will have unlimited access to buses. Make sure you always validate the ticket as controllers often check them (the minimum fine is 40€). You can also use the bus tickets on tram lines. Tram is the latest come in Florence: it has really revolutionized the mobility conditions. It is comfortable, punctual, ecological. There are three lines already active (and two in progress). Control the routes of the different lines here. Another option is the Florence Bus Tour, hop-on hop-off bus that serves all of the major attractions. Traffic however can be extremely heavy at times, and riding may therefore take longer than walking. Sightseeing tours on open top, two story buses, may also be a good way of getting a general grasp of the city if you are not here for long. 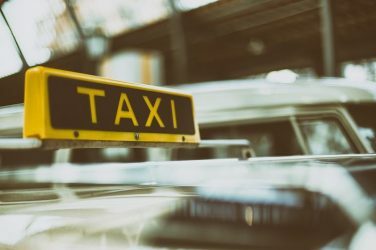 Taking a taxi can be a good option at night, for instance when you want to try out a restaurant on the other side of the city. Unlike most places, in Italy taxis cannot be flagged down as they pass you in the street. They are stationed in taxi stands, present in most of the main squares, airports and train stations. The rate from Florence’s airport to the city center is about 20€. If you can’t really give up using the car, a good option is the car sharing service. The service, simply accessible by downloading an app, allows you to use the car for the time you need, to enter in the ZTL area and to park in the resident spaces. You can pick up the closest car to your position, since sharing cars are parked all over the city. Check the websites to find out details and tariffs. Parking the car is one of the hardest things to do in Florence…but never losing hope! If you are just visiting the city for the day, it is best to leave the car in one of the many car parks that surround the historical center. The bigger one is under the train station of Santa Maria Novella. Near the train station (western side of the center), you can also park under the Fortezza da Basso and Porta al Prato. To the east of the center, you’ll find the parking under Piazza Ghiberti (called Sant’Ambrogio) and Piazza Beccaria. To the north, the one in Piazza della Libertà (Parterre) and to the south the one in Porta Romana, just to mention the most central. 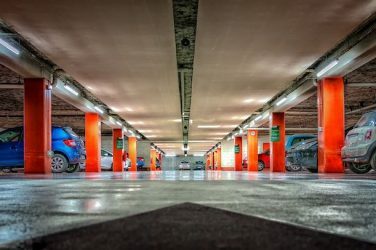 You can check in real time how many parkings spaces are available in the various car parks on this website (unfortunately only in Italian language). You can also download the ParkMe app for iPhones and Androids. If you are here for a longer stay, ask your hotel for advice as they often have special deals with private car parks. The cost tends to be between 1-3 € per hour but it can go up to 8€! There are also private garages inside the city center that cost roughly 30€ per day, but are handy if you want to stay closer to the main sites. Street parking is also available, particularly in the residential areas. They are harder to come by, but cheaper. Just remember to park in the blue spaces, as the white ones are for residents only. Lastly, if you are here for a while, you can park outside Florence and use public transport to get to the city center. This is the cheapest option: it’s safe and highly recommended!